"Your Phone app allows you to view, send, and receive the SMS from your Android, on your computer." Microsoft has released a new preview build from the Redstone 5 branch, which is the next version of Windows 10 slated for an October release. The company is hustling to kill the bugs and introduce stability and performance improvements ahead of its planned launch. While doing so, Microsoft has also started to release builds from the 19H1 branch, which will arrive in the first half of next year. Windows 10 October Update follows five feature updates that have been released under the new Windows as a Service model, including the November Update, the Anniversary Update, Creators Update, Fall Creators Update, and the April 2018 Update. Unlike the last few builds being sent out to the Fast ring, today’s doesn’t just focus on general improvements, but also brings one new – and quite helpful – feature. 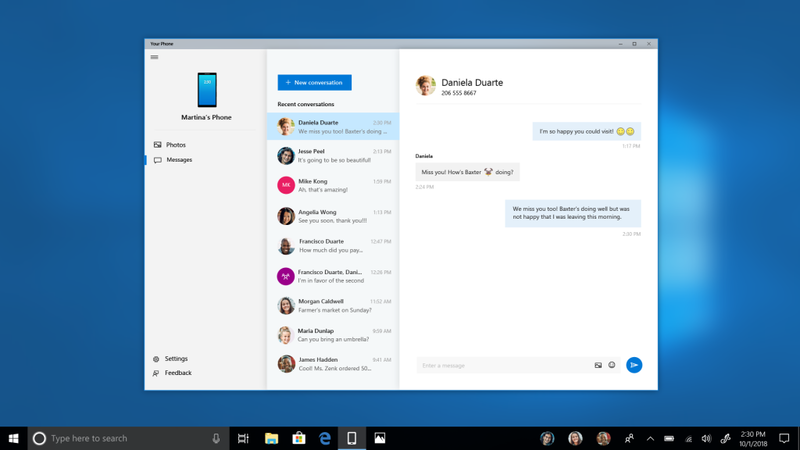 Using Your Phone app, Insiders can now check and send text messages from there PCs. Here is everything that is new with Windows 10 Insider Preview Build 17755 (RS5), which is now available to Windows Insiders in the Fast ring. No need to dig for your phone to text. Leave it in your pocket, bag, or purse. Your Phone app now gives you instant access to your most recent photos and texts from your Android phone. Snap a pic on your Android, see it on your PC. It’s just easier. Text your friends, group message, and type with a keyboard —Your Phone app allows you to view, send, and receive the SMS from your Android, on your computer. There are a few ways you can text from your PC. We mentioned the ability to type with a keyboard, the obvious. But how about inking a reply? On pen-capable devices, use your digital pen to focus near the text field in Your Phone app’s messages. Ink a message and watch your fresh ink convert to text and send. Or try using just your voice to dictate a message (US English only at this time). Press the Windows logo key + H to start dictation. On a touch keyboard, select the microphone button. Use dictation to make your text entry easier. Try it out and let @VishnuNath know what you think. We can’t wait to hear from you. Love it, like it, or have feedback in any form – share it! Have you pinned Your Phone app to your taskbar yet? We are still finetuning the app, so if you are looking for support, check out workarounds in Your Phone app FAQ. Your Phone app is also live for Insiders who are in Skip Ahead running 19H1 builds. You must link your Android phone to your computer through Your Phone app. You will receive an app from Microsoft, which you must download to your mobile phone and follow the setup prompts. Android 7.0+ are compatible with Your Phone app. For PCs tied to the China region, Your Phone app services will be enabled in the future. We fixed an issue resulting in slower resume from hibernation on certain devices in the last few flights. We fixed an issue resulting in HDR video being unexpectedly clipped in certain situations. We fixed an issue resulting in Windows Hello spending more time in the “Getting Ready” state in recent builds. For known issues, head over to the official blog post.